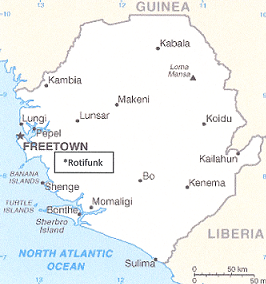 Sierra Leone is located on the western coast of West Africa, just north of the equator at 8 ‘30” N latitude. It is slightly smaller than state of South Carolina at 71, 740 sq km. It’s tropical climate has two distinct seasons: hot, humid, summer rainy season (May to December); winter dry season (December to April). Rainfall along the coast can reach 495 cm (195 inches) a year, making it one of the wettest places along coastal, western Africa. Long known for its diamonds, Sierra Leone is rich in other minerals. Iron ore mining is currently expanding and becoming a major export. Titanium ore, bauxite, gold, and chromite are also found.